(1869-1952) Born in San Francisco in 1869, Percy Gray came from a long line of British artists. He studied locally at the School of Design under Emil Carlsen. He then worked as a quick-sketch artist for the San Francisco Call. In 1895 he moved to NYC where he spent 11 years working as head of the art department for the New York Journal. While in NYC he studied at the Art Students' League and with William Merritt Chase. Gray returned to San Francisco in 1906 and joined the art department of the Examiner where he remained until about 1915. By that time he had established himself as a professional landscape painter. From 1918-23 he maintained a studio in San Francisco's old Monkey Block (now the Transamerica Pyramid) which also served as his living quarters. In 1923 Gray married and settled in Monterey where the newlyweds purchased for their home and had built on another site, the historic Casa Bonifacio. 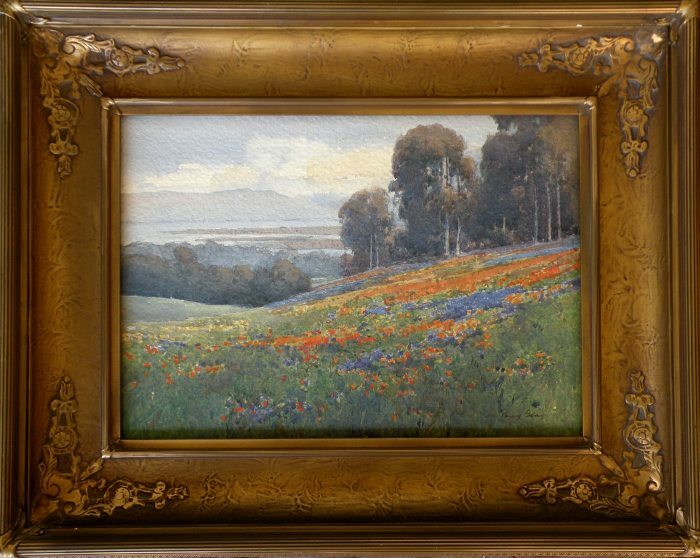 Working from his studio attached to the house, Gray attained total mastery of his watercolor technique during his Monterey years. The last year of Gray's life was spent as a resident of the Bohemian Club in his native city. He died of a heart attack in his studio in 1952. Works held: Oakland Museum; Bohemian Club; Bancroft Library; California Historical society; Society of California Pioneers; Crocker Museum; Santa Barbara Museum; Stanford Museum; Nation Museum of American Art. Exhibited: Bohemian Club; San Francisco Art Association; Pan Pacific International Expo.